I have just begun a bit of reading about Charlotte Mason and her educational theories, beginning with A Charlotte Mason Education by Catherine Levison this past year. So far, I really like what I have read. So many little bits of wisdom that I need to let sink in. 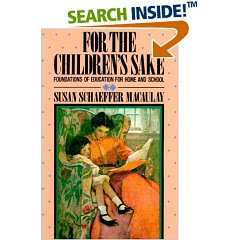 My sister gave me the book For the Children's Sake by Susan Schaeffer Macaulay for Christmas, and I was anxious to dive right in. While I am not sure a perfectly 'Charlotte Mason' education is right for my boys, there are so many points that I need to take to heart. This book will be read again and again. I think I would recommend reading For the Children's Sake prior to reading A Charlotte Mason Education. Probably the single most striking piece of advice that jumped out at me is that we as parents and teachers need to spread the feast. We need to take the best of what is available in music, art, literature, nature, and the other things that surround us. We must make the real stuff readily available for the children and let them feast. Less lecturing, explaining, disecting, and much more letting the child make his own relationship with the best our world has to offer. This idea seems to run in the opposite direction of current schooling. We have watered-down, tasteless text books which we then use to lecture, disect, and explain until we are blue in the face. I feel as if I am doing a decent job spreading the feast, but always feel as if I have to explain everything Levi might not understand. Note to self: more spreading, less talking. Charlotte Mason's views on children as individuals and the respect she showed for each is a breath of fresh air. I am inspired to allow my boys more free play time and as much of that outside as possible. Hopefully that will get easier with time as Luke and especially Leif are able to spend time outside with less parental involvement. There is a little danger in these days of much educational effort that children's play should be crowded out, or, what is from our present point of view the same thing, should be prescribed for and arranged until there is no more freedom of choice about play than about work. We do not say a word against the educational value of games (such as football, basketball, etc.)... But organised games are not play in the sense we have in view. Boys and girls must have time to invent episodes, carry on adventures, live heroic lives, lay sieges and carry forts, even if the fortress be an old armchair; and in these affairs the elders must neither meddle nor make. The website Simply Charlotte Mason is an incredible resource I have recently discovered. It is added to my favorite websites on my side bar. I urge you to explore their site if you are intrigued by the ideas of Charlotte Mason. I just finished reading this book which a friend lent to me. As I gave it back to her I realised that it is one that I would love to own. I found it a great introduction to the Charlotte Mason principles. After reading I was also inspired to allow my children more free play outdoors. We are about to start home schooling. I have three children, 5, 3 and 10 months. You might find me hanging around here a bit....your blog is great! Embejo~ I'm so glad you took the time to comment! It is nice to meet you. :) Sounds like your kiddos are just a little bit younger than mine--same age spread. Feel free to visit and comment any time! I read a quote from this book on your blog a little bit ago. Then I realized that I have had the book For The Children's Sake for several years. A friend whose children are much older than mine, had passed this book along with several others on to me. I am finally reading it. What a gem I had on my bookshelf and I was not even aware of it! Heather~ I know you'll enjoy it! I love the gentle tone of this book. I have a tape by SSM and it is my all time favorite tape to listen to. To tell you the truth....you don't need to read all of Charlotte's stuff. This book is like 'the best of' version. And I love it. Yes I have read bit of the original CM series and I have many other books about CM. But this one is just simple and clear.